In the April 2013 worldwide General Conference of The Church of Jesus Christ of Latter-day Saints (often inadvertently called the Mormon Church), Elder Jeffrey R. Holland related the moving story of a man who approached Jesus Christ to heal his afflicted son. The father explained his son’s dangerous condition and pleaded, “If thou canst do any thing, have compassion on us, and help us” (Mark 9:22). Elder Holland emphasized that the father’s faith, though imperfect, was enough. I listened to Elder Holland’s message grateful for the Savior’s loving mercy to this family, and appreciative for the Savior’s power to heal our bodies and our souls. The Savior’s priesthood power, or authority to act in the name of God the Eternal Father, was evidenced throughout His ministry as He turned water to wine, healed the sick, cleansed lepers, and raised the dead. His ministry was the salvation of souls and, to me, some of the most tender stories demonstrating Jesus Christ’s power were when He forgave people’s sins. The Lord Jesus Christ taught that priesthood power is to help and benefit others. 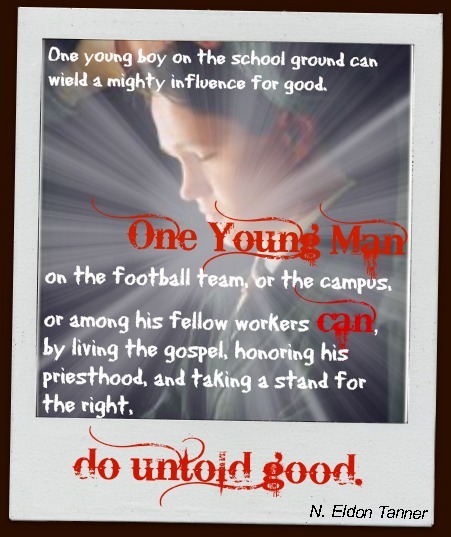 The priesthood cannot be selfishly used for one’s personal gain. The priesthood also must be given to a person by someone who already has the priesthood authority and it is given by the laying on of hands. And when he had called unto him his twelve disciples, he gave them power against unclean spirits, to cast them out, and to heal all manner of sickness and all manner of disease (Matthew 10:1). Priesthood power and authority is on the earth today. After the death of Jesus Christ and the Apostles, the power to act in God’s name was lost from the earth. In May 1829, John the Baptist conferred the Aaronic (or lesser) Priesthood, and Peter, James and John conferred the Melchizedek (or higher) Priesthood upon Joseph Smith and Oliver Cowdery, who under the direction of Jesus Christ restored His Church in its fullness again to the earth. (See Joseph Smith-History 1:68-72). The Savior is the worker of miracles. He is the great Healer. He is our example, our light, even in the darkest moments, and He shows us the right way. Let us follow Him. Let us rise up to our role and become healers by serving God and our fellowmen. My father received the priesthood authority by the laying on of hands from his father who also held the priesthood. Dad has used this power as a healer in our home for small simple needs and for life-threatening situations. A dramatic experience that vividly remains in my memory occurred when I was five years old. My family lived on a farm and the only concrete on our property surrounded a cement, in-ground swimming pool. One day while pushing my two year old brother around the pool on a tricycle, he steered into the deep end of the empty pool. He fell nine feet down, hitting his head on the bottom of the pool. My cries alerted both nearby parents who carefully his cradled his lifeless body. We lived in rural Arizona and the nearest hospital was 60 miles away. On the way to the hospital, my parents stopped at some friends’ home and the husband and my dad poured consecrated oil and placed their hands on Donovan’s head and in the name of Jesus Christ commanded his body to heal without residual problems or effects. By the time Donovan reached the hospital, he was responsive. The doctor decided to keep him overnight in case of a concussion, but Donovan suffered no effects from the fall. Another healing experience strengthened my faith and testimony in the power of the priesthood. My husband and I took my visiting sisters and a boyfriend to jet ski on the lake. I took my youngest sister for a ride with me. Wanting to show her how to do a corkscrew, I gunned the gas and pulled the steering hard to the left. However, she had let go of me and as the jet ski dove into the water, she flew above it and then landed with legs extended on the jet prop. I helped her back onto the jet ski bleeding and writhing in pain. My husband heard her shrieks across the lake and met us at the dock. We laid her on a picnic table. Examining her cut private parts devastated me. She was a minor and I did not have a medical release from my parents and knew she needed stitches. I could not reach them. I called our friend who is a physician who told us to come straight to his house. My husband and our other sister’s boyfriend had received the priesthood. They laid their hands on my sister’s head and in the name of Jesus Christ promised that she would be healed. The bleeding stopped as we rushed back to town. By the time we reach our friend’s home, my sister had been healed! The physician did not see any damage to her delicate parts and felt that she did not need further medical care. What a miracle! Jesus Christ miraculously blessed those around Him who had a measure of faith. He gave His Apostles the power and authority to act in His name. Today, that power and authority is restored to the earth. The priesthood has blessed me and my family through miraculous healings as well as blessings of peace and comfort. I am so grateful for God’s mercy in allowing His power to be used to bless and strengthen our lives. I know He lives and that the authority to act in His name is available through His restored Church which is The Church of Jesus Christ of Latter-day Saints. I invite you to learn more of the blessings and power of the priesthood by contacting the missionaries of The Church of Jesus Christ of Latter-day Saints.